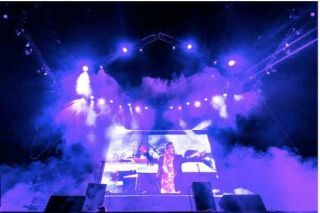 Slamhammer recently deployed a host of Martin by Harman fixtures to elevate “Prince: Live on the Big Screen”, a live tribute concert that was held at Target Center arena in Minneapolis. The centerpiece of a four-day celebration of Prince’s life, the show took place on April 20, 2018 at the 20,000-seat Target Center. The performance featured an all-star cast of musical collaborators from throughout the legendary musician’s career, playing alongside multi-track recordings and live concert footage. Paisley Park hired sound and lighting provider Slamhammer to create a versatile lighting rig for former Prince lighting designer Charles Ford. In order to deliver stunning visuals that would complement the video footage, Slamhammer selected an arsenal of Martin MAC Axiom Hybrid, MAC Viper Profile, MAC Aura, MAC Quantum Profile, and MAC Quantum Wash fixtures. The stage was set up at one end of the arena, with the musicians arranged in front of the main screen. Two sets of trusses equipped with MAC Viper Profile and MAC Quantum Wash fixtures were deployed at 30° angles around the musicians, which allowed for better side coverage. The team mounted Martin MAC Axiom Hybrids on two high trusses on either side of the stage for beam, spot, and wash effects. Auras on a downstage truss provided an even front wash, and MAC Quantum Profiles on the floor kept the individual musicians in focus. Ford’s lighting design utilized the full spectrum of the MAC fixtures’ smooth color mixing and variety of effects, saving the obligatory purple for the most climactic moments.